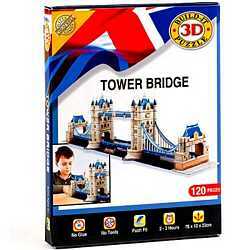 Wonderfully detailed and true-to-life Tower Bridge 3D Kit. Build your very own giant scale model of this world-famous building from push-fit puzzle pieces. No mess… no special skills or tools… or glue required. Suits ages 8+, taking an average 90 minutes to build. Adult assistance recommended for younger users. Full instructions, history and interesting facts and figures included.